The market for traditional data center infrastructure continued to grow during the past 12 months, despite the increasing popularity of public cloud services, with enterprises spending about $113 billion on servers, switches, routers, WLAN and other gear in 2017. Overall, the data center infrastructure market grew about 3% between 2016 and 2017, according to figures released this week from Synergy Research. The report measures six specific parts of the infrastructure market: servers, switches and routers, hosted and cloud collaboration, on-premises collaboration, network security and WLAN. The big winner of the past 12 months was Cisco Systems Inc. (Nasdaq: CSCO), which led four of the six segments, and controlled about 26% of the overall data center infrastructure market. Hewlett Packard Enterprise placed second with an 11% market share. 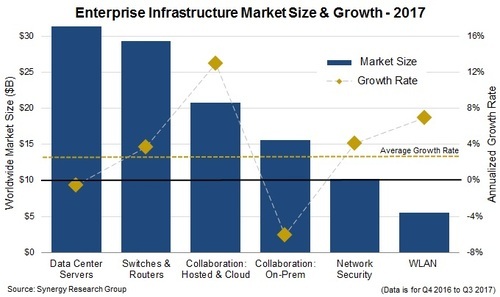 However, the Synergy report finds that public cloud is steadily eroding this traditional, on-premises market, and that the fastest-growing segment -- hosted and cloud collaboration -- is specifically tied into the growing importance of services delivered to enterprises. "The focus of that spending is changing, however, with a growing emphasis on hosted solutions, subscription-based business models and emerging technologies," Synergy's founder and chief analyst, Jeremy Duke, wrote in the report. "Those changes will continue to present challenges for incumbent vendors and opportunities for new market entrants." In the Synergy report, Cisco was the leading vendor for switches and routers, on-premises collaboration, network security and WLAN. While HPE was second to Cisco in this market, the company only led the server market in 2017, but came in second in WLAN and third in routers and switches. Microsoft Corp. (Nasdaq: MSFT), was the top vendor for hosted and cloud collaboration systems. Other top companies in this market include Dell EMC in servers, Huawei Technologies Co. Ltd. in switches and routers and Check Point Software Technologies Ltd. (Nasdaq: CHKP) in network security. Synergy also noted that Super Micro Computer Inc. , Arista Networks Inc. and RingCentral Inc. also posted high growth rates.